If you’re looking for a variety of different kinds of pheasants, then this assortment is sure to meet your needs. 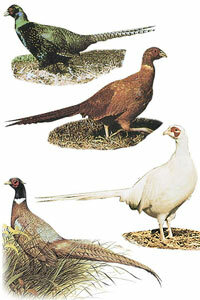 Our choice of at least 3 different kind of pheasants taken from Chinese and Jumbo Ringnecks, Kansas & Melanistic Mutant. We are sure this beautiful assortment will please you. A physical address of the final destination is required for the health papers that accompany the birds. You must provide this when booking your order.